To survive in the 21st century, a company needs to have a proactive environmental Policy. 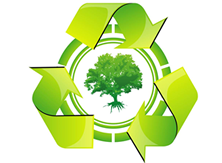 At Daikoku we produce Eco friendly products that can help reduce garbage and cut down carbon dioxide emissions. Molded pulp food containers which do not require petroleum resources for their production and wooden cutlery are used widely in Japan. We want to introduce such products in other countries as well. 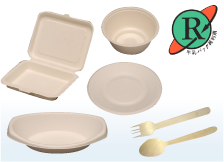 Molded pulp food containers are made of bagasse or reed. Since these are environmentally friendly materials, there is no harmful impact on the environment even when the containers are thrown as garbage. Milk packs are made up of very thick paper. At Daikoku we make table napkins and paper wet hand towels from milk pack recycled pulp. We offer spoons, forks and knives made of sustainable wood. Sustainable wood is obtained by moderately cutting the trees and by using the resources in a way that forests are not destroyed.